Particularly in the pharmaceutical, food, chemical and construction industries, being able to analyse the moisture content of materials at Goods Inwards and production is an important tool to ensure product quality and robust production processes. 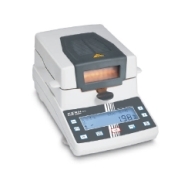 The device displays automatically the value when the equilibrium is reached. The set is composed with the reference measurement device (Testo 650), the measurement cell and the thermal printer. The USB sensor can be directly connected to the PC to measure the water activity with HW4 software. Connect up to 64 measuring heads directly to a PC. HC2-AW-USB is the perfect device for multi-station applications. Response time t 63: <20 sec. The construction developed here enables a measurement of dew point very near the sample. It enables fast and accurate humidity (water activity) measurements without requiring an internal ventilation system, significantly reducing fouling notament for powdery material measures. The absence of moving parts in the sensor allows a superior long-term reliability. Cleaning is made easier by direct access to the cooled mirror and other elements of the sensor. The airtight micro chamber and the sample receptacle is made entirely of stainless steel 316L. An infrared thermometer measures the temperature of the sample without contact. The OILPORT 30 hand-held meter is used for the mobile monitoring of the moisture content and temperature in different oils. The simple and intuitive operation via TFT touch screen and the built-in data logging function make the OILPORT 30 hand-held the ideal tool for fast and reliable oil analysis. Relative water content / water activity [aw] (current water content in relation to the water content in a saturated oil sample) Completely water-free oil has an aw value of 0, completely saturated oil has an aw value of 1. The OILPORT 30 hand-held meter always determines the water activity aw and the temperature T. By entering oil-specific parameters, the hand-held meter can calculate the water content in ppm and show it in the display.